Tag Archives: fun movement break. Music teachers have always known that movement is an essential part of our music classes. Dalcroze Eurhythmics teaches concepts of rhythm, structure, and musical expression using movement. (as is common in Orff and Kodaly approaches) In this article, I’m going to give examples of music to teach concepts, and movement to “get the wiggles out.” Kids today have a much harder time staying focussed and attention spans are really short. Giving kids in your music classes a quick movement break is great for moving to the beat AND great for getting the wiggles out. As the countdown to the end of the school year progresses, behavior worsens. A fast paced music lesson, with frequent movement breaks to wear them out, will help to manage the behaviors in your classroom. Researcher Terrence Dwyer is one of many who have conducted multiple studies suggesting that exercise supports success in school. His research found that exercise improves classroom behavior and academic performance (Dwyer, Sallis, Blizzard, Lazarus, & Dean, 2001). An excellent article – Move Your Body, Grow Your Brain – is found here: https://www.edutopia.org/blog/move-body-grow-brain-donna-wilson. This is an example of a movement activity to teach concepts. In this movement activity, the students will explore moving when the teacher plays the woodblock or drum. When the teacher stops playing, the students stop and freeze. Tell the students, “Make your feet do what the drum plays. When the drum stops, you stop.” Each pause should be a different length. Students love the anticipation that builds while they wait for you to play a new pattern. Ask the students to tell you when there is a beat and when there is no beat. Mix up the patterns. Sometimes play the same pattern twice. Vary the length of the patterns. Play the patterns at different tempos. Try playing with different dynamic levels and observe if the students respond with movement to show the different dynamics. Repeat this activity frequently. Later, try playing a piece of instrumental music and have students move when you play it, and stop when you pause. The Jig Jig Jiggles is a great movement break and is great for reinforcing steady beat, and for teaching about fermata. I got the jig jig jig jig jiggles. I got the jig jig jig jig jiggles. My momma and my daddy want me to be still….. But I love the jig jiggles and I always will! Ooo feeling fine. I can’t get the jiggles out of my mind. Oo oo feeling fine. I love the jig jiggles, do them all the time. I got the hop hop hop hop hoppin. I got the hop hop hop hop hoppin. My momma and my daddy want me to be still….. But I love the hop hoppin and I always will! I got the bop bop bop bop boppin. I got the bop bop bop bop boppin. My momma and my daddy want me to be still….. But I love the bop boppin and I always will! Source: Primary Dances and Singing Games – available as print book/CD or download . Everybody shake! Doo doo doo, Doo doo doo, Doo doo doo doo doo. Everybody jump! Doo doo doo, Doo doo doo, Doo doo doo doo doo. Everybody twist. Doo doo doo, Doo doo doo, Doo doo doo doo doo. Everybody hop! Doo doo doo, Doo doo doo, Doo doo doo doo doo. Movement Songs Children Love is an old favorite collection of movement songs. – some of the songs are in Musicplay – if you don’t have Musicplay, this is a collection you’ll love! One Green Jellybean is a great song for Easter. Listening 1 #29 – play the Copycat Game or lead the students in different ways to keep the beat. There are many movement activities in the Listening Resource Kits (and the online site) that will get the kids exercising, keeping a beat, and helping their brains grow! Moving to music is an essential part of your music classes. Use movement breaks to help the kids maintain focus and to wear them out enough that they’ll sit and listen for you. Create an account and get one month free! Current subscribers – To thank you for subscribing, we are going to give you an extra month on every one year subscription! (online renewals only) When you’re ready to renew your yearly subscription, email denise@musicplay.ca for your discount code. * Beat/Rhythm Activities for Gr. K-1-2! Coming soon, beat/rhythm for Gr. 3. * Did you know we have an EXTRA Listening section? Go to Listening on the left menu. Select the Extra tab. There are instrument demo movies, So-me Storybook movies (all 12 stories!) and for band teacher, movies explaining how to care for your instrument. 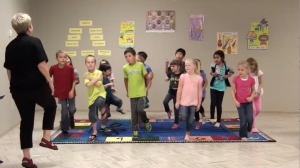 This entry was posted in Classroom Management, Lesson Plans, Listening Lessons, Movement, Uncategorized and tagged Denise Gagne, fun movement break., Movement activities, Moving to music, music lesson plans, Musicplay on April 9, 2017 by Denise Gagne.